Ok so these books aren’t technically children’s books; they’re very much written for adults. Instead, it’s the style of the books which is taken from traditional children’s literature – they are interactive, made up entirely of heavily illustrated postcards and private letters that you can remove from their envelopes. I heard about this trilogy on an episode of the Books on the Nightstand podcast and knew straight away I needed to check them out. I’m always on the lookout for new things to read which are a little different; this one certainly piqued my interest. It’s good to get in touch with you at last. Could I have one of your fish postcards? I think you were right – the wine glass had more impact than the cup. So begins this extraordinary correspondence between Griffin Moss, a postcard illustrator living in London, and Sabine Strohem, a postage stamp illustrator from the fictional Sicmon Islands. The book is without introduction, background to the conversation, or hint as to how these two people know one another. As a reader, you begin the book in exactly the same situation as Griffin, for he also knows nothing about Sabine. The mysterious Sabine has been linked to Griffin for many years, with the power to see his artwork through his very eyes. He struggles to believe this fact, but what choice does he have? 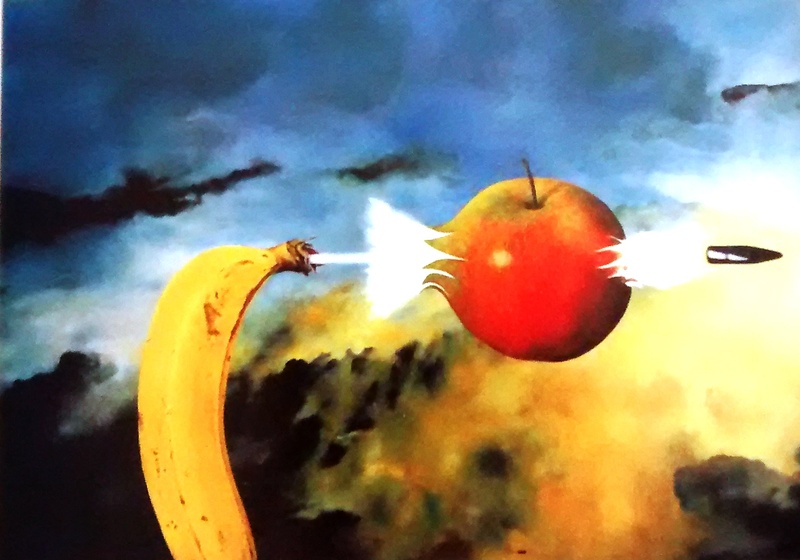 How else would she know that he darkened the sky in his most recent painting? This begs the questions is she real? Or merely a figment of Griffins grief addled mind? Through their correspondence Griffin gets to know Sabine, and lays bare his soul for the entire world to see. The journey through their correspondence brings them closer together, though they are separated by thousands of miles of land and ocean. The experience of reading this book was truly amazing. I was sceptical, mainly because I knew these books had been published in the 90s but that I had somehow never heard of them until now. But I was so far from being disappointed. 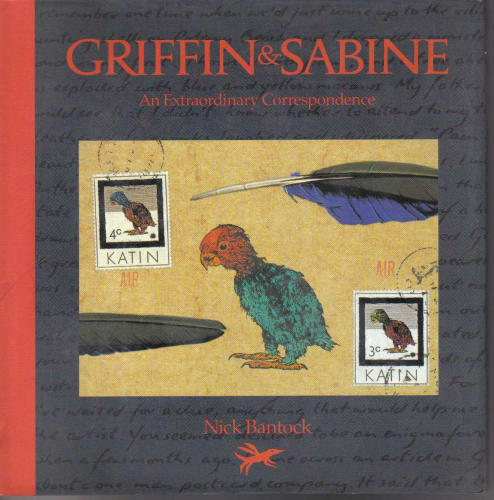 As the relationship between Griffin and Sabine unfurls you are able to delve into it on such a personal level. There is something so deeply intriguing and alluring about reading the story through private correspondence, as though you can enter the minds of both Griffin and Sabine. At no point are the characters actively described in terms of appearance and yet by the end of the book I had developed a clear image of both in my mind. The illustrations are stunning. And so they should be, drawn supposedly by professional postcard and stamp illustrators. I felt as though I could spend hours studying the images, while the text itself could probably be read in just half an hour. 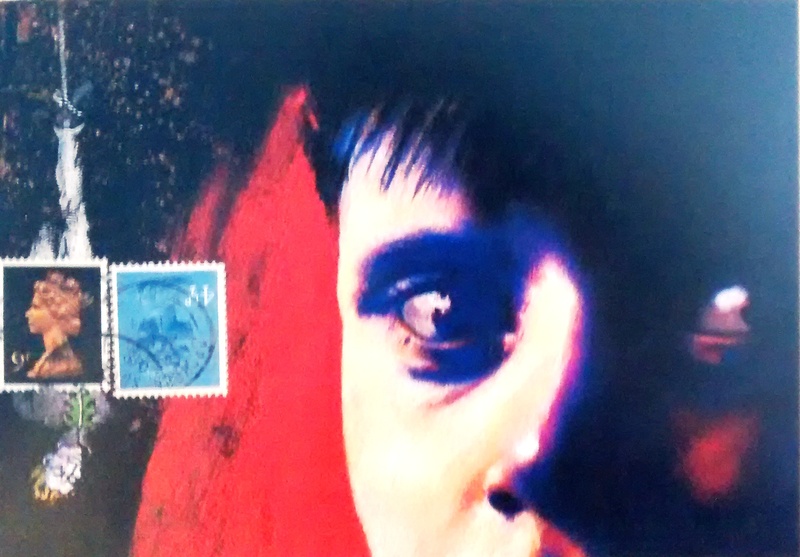 At times the images of the postcards seem to illustrate the passion written in the short blurbs of text. So – you’ve been making love to me ten thousand miles away – how tantalizing. It’s all rather steamy, I can feel myself blushing – if I feel like this what kind of affect is it going to have on Griffin?! Their relationship intensifies to the point that Griffin thinks himself insane, convinced that he has imagined himself a companion to sooth his troubled soul. He panics, terrified of what might happen, and attempts to break all ties with Sabine. But she is not to be played with. There are so many questions left unanswered. So much I want, no, need to know. Thank goodness I already have the rest of the trilogy. Faced with the terrifying prospect of coming face to face with his own imaginary creation Griffin has fled London. Meanwhile his muse sits quietly, patiently, awaiting his return, having taken up refuge in his empty flat. 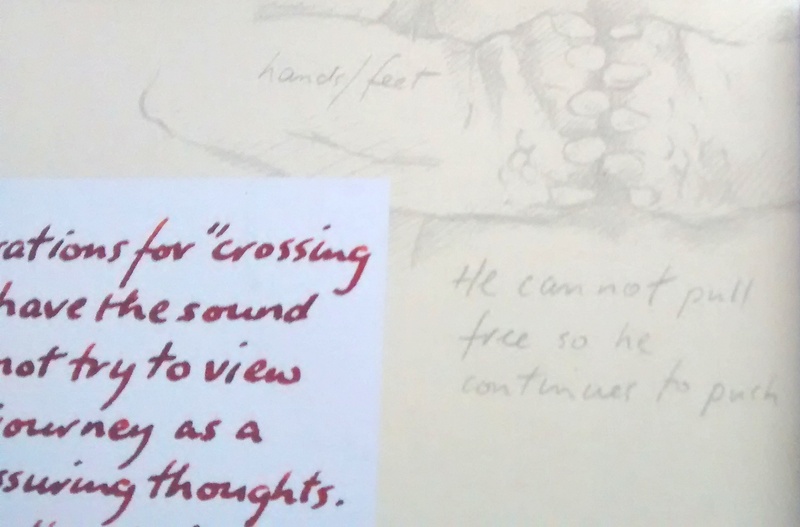 The second book is told with the same beautiful postcard and intricately decorated envelopes that make up the correspondence between the two star crossed, and, possibly imaginary lovers – but with the added bonus of doubling up as Sabine’s notebook. 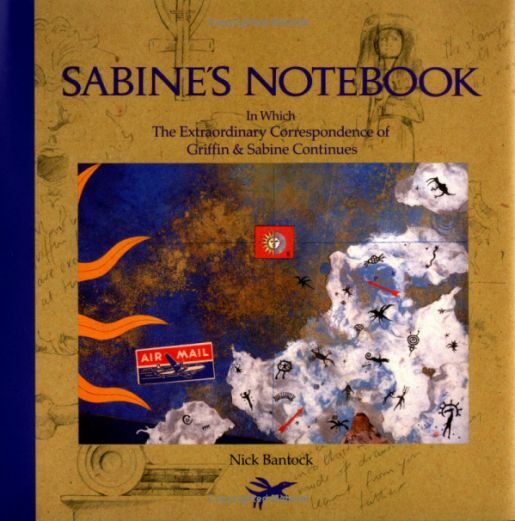 The pages which surround Griffin’s letters and cards serve as extra space for Sabine to doodle, sketch, wonder and muse. Griffin travels all over, Dublin, Italy, Egypt, picking his way through crumbling ruins and ancient civilisations, drawing further into the abyss of the past, running further and further away but from what? All the while Sabine sits patiently in his flat in London, or else taking the occasional excursion to more rural England, waiting for his return. Sabine serves as Griffin’s voice of reason – guiding him on his journey, puzzling through his problems in her intricate sketches, and ultimately, leading him home to her. The second book flings up even more questions which will leave you itching to get your hands on this third. Griffin is in back in London, and Sabine is back in the Sicmon Island – somehow they missed each other. But how? The final book in the trilogy sees Griffin and Sabine suffering silently against the unseen forces which keep them from one another. Sabine has returned to the Sicmon islands, she has washed her face in the sea and felt the sand between her toes, and yet she is unhappy. Her visions of Griffin’s artwork are fading, and a mysterious stranger is haunting her everywhere she goes. The final part of the trilogy is told once again through postcards and letters, but this time the illustrations begin to take a darker form. Shadows emerge in the corners of the page, threatening to engulf that which lurks within the images. The fog leaks across the page, like that which creeps before the eyes of Griffin and Sabine, a physical representation of the dark forces at play. Desperate to be with one another Griffin and Sabine try one last time to make a connection. 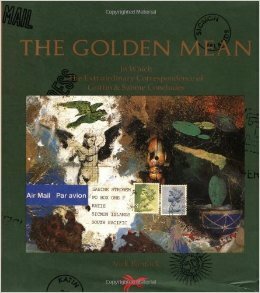 Far from being a conclusion to the trilogy, The Golden Mean throws up just as many new questions as it answers old ones, and may leave the reader feeling many combinations of feelings – but I can guarantee this will not include disappointment. From what I had heard about these books before I bought them, I expected them to be good, but not mind-blowing. I thought they would be novel – having books made out of postcards is such a quirky idea, but really, how far can a story be told in this way? So, how do I feel now I’ve finished the books? Suitably humbled. These books aren’t just good, they are really something special. Bantock’s artwork, imagination, and the intimacy and passion with which each letter is written combine to create a trilogy of books which really shine. The books are niche, clever and, above all, a truly epic read. I have been completely drawn in to Griffin and Sabine’s world. I would recommend these books to crafty types, arty types, fans of children’s fiction, fans of fiction, fans of pictures books – in short, pretty much everyone, other than those who only read non-fiction. I bought second hand copies of these books and read them – after reading this review I just had to! I completely concur with your views… I was not disappointed! I felt really drawn in to the world. The format really does let you feel the emotions of Griffin and Sabine! I was eager to read the next card or letter as if I was waiting for them to drop through my door. And when I saw a letter from the stranger in The Golden Mean rather than one penned in Sabine’s familiar writing I was almost devastated, as I imagine Griffin would have felt tenfold. The format of the books, with removable letters and a handwritten appearance was so completely up my street. It made me feel like I had found a stash of letters in a box in the loft and was sifting through them. I also found that by the end of the trio I had turned into an amateur detective, analysing what was said, subtle messages… The handwriting and the pictures, even the titles of the postcards, trying to piece the story together and explain what was happening and what the conclusion of the books meant. Overall a very good recommendation! Thank you! I’m so glad you enjoyed them – although there was never much of a doubt in my mind that everyone who reads them will love them. How can you not? Thanks for stopping by!